The Collings D2H is an interpretation of the classic Dreadnought body steel string guitar and effectively illustrates just how good that design can sound. Built in Austin, Texas the D2H features a Sitka Spruce top, Indian Rosewood back and sides, Honduran Mahogany neck and Ebony fingerboard and bridge. 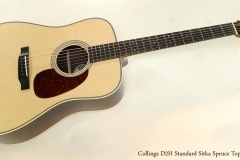 We’ve received three new Collings guitars, this D2H among them. It is a stunning guitar. Though new and unplayed, it has incredible tonal complexity with excellent balance across the spectrum. 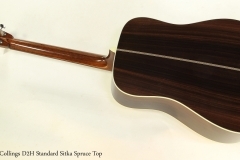 We ordered this guitar with one custom feature – the nut is slightly wider at 1.75 inches (44.5mm). Typically, the nut is 1.6875, or 1 11/16 inches (42.85mm). Typical of Collings guitars, this example is impeccably built. Collings not only builds extremely well but has some of the highest quality control I’ve ever seen. They have also truly mastered lacquer finishing. The original Collings arched top hard shell case is included.